The expected Jon Lester - Max Scherzer pitcher's duel never materialized as the Tigers got to Lester early and the Sox chipped away at Scherzer late in what was an 8-6 Detroit win over the Red Sox at Comerica Park. The Tigers scored in each of the first 4 innings, eventually knocking Lester out of the game with 1 out in the bottom of the 5th inning. He was charged with 5 runs on 12 hits and 1 walk. Uncharacteristically, he didn't strike out a single batter. The Red Sox scored single runs in the 4th through 7th innings off Scherzer and added another pair in the top of the 9th inning before falling short. 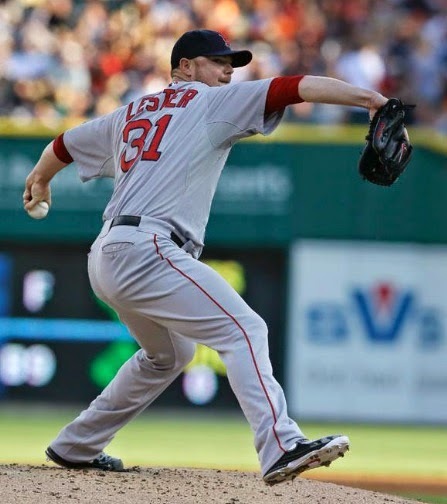 Lester's record fell to 6-7 on the season; Scherzer notched his 7th win against 2 losses. The Boston offense rapped out 15 hits, including 3 by Dustin Pedroia and Daniel Nava; Brock Holt and Xander Bogaerts had 2 hits apiece.